about the importance of being thankful for all we have. here if you’d like a printable version of these ideas. I hope you find some or all of these ideas useful! You will know what is right for your class! class and make a list on the board for all to see. class and make a list on the board. know what is right for your class! up the tree wherever is best for you. everyone’s mind during this Thanksgiving season! out the Thanksgiving leaves he/she has in her hand. express what they are thankful for. Say “Thank You” in many languages. Teach your students to say “thank you” in many languages. in other languages below) and assign one word per student (or partner pair). 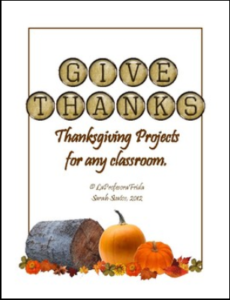 These are only some of the ideas shared in La Profesora Frida’s FREE download for Thanksgiving! Please swing by La Profesora Frida’s TeachersPayTeachers store today and download the entire packet of ideas!